Captain Phillips is exceptionally well made (provided you are not shakycam-phobic), edge-of-the-seat storytelling. On that level, it’s pretty much what you’d expect from the director of the latter two Matt Damon Bourne films. But that’s also the problem with it. A degree of topicality or political sensibility has informed most of Paul Greengrass’ big screen ventures, and this seemed poised to follow suit. Yet, on leaving the cinema, I was left puzzling over his reasons for adapting this real life drama. He has turned out a gripping action movie but one that ultimately amounts to little more than that. When asked what attracted him to this account of the 2009 hijacking of Captain Richard Phillips’ container ship by Somali pirates, the director told Empire magazine “It’s the haves and have-nots, the big global wheels that are throwing up winners and losers”. Given his statement of intent and how tangentially (dare I say glibly) his film addresses this subject, I am still left wondering why he wanted to make it, or how he thought Billy Ray’s script would provide viewers with food for thought in this area. It’s one thing to make a fictional movie that provides incidental commentary on real world issues, but surely their "plucked from the headlines" choice brings an additional onus and responsibility? Is a particularly palpable white-knuckle ride the best one can expect? 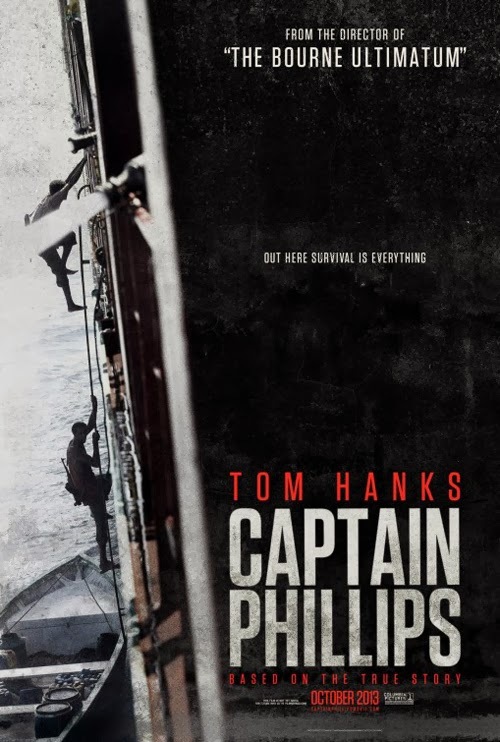 There has already been much discussion on the ifs and maybes of whether the good Captain (he must be good, Tom Hanks is playing him) made the right decisions. In part, this coverage has been seen as a preamble to potential Oscar nominations (during the canvassing period mud tends to be slung vehemently at pictures purporting to base themselves on fact, but which deviate from the total truth, despite their not being up in the Best Documentary category). It’s a conversation worth having, but I’d suggest that any issues are as much to do with the choice of leading actor as anything the film gets intrinsically wrong. The intimations that the captain may not have made the best choices are scant, and sink without trace beneath Hanks' intrinsic likability. This comes down to an issue of fidelity, and whether Greengrass is more concerned with his message (the haves and have-nots, remember) or attempting a character study of the captain warts and all. Given that we spend the majority of the running time in Captain Tom’s mental space, and the result most certainly falls on the side of heroic fortitude, I’d suggest Greengrass isn’t interested in presenting a balanced or accurate depiction of the man. I don’t think this need be a problem if the broader message comes through. The Phillips of the movie is shown as a diligent fellow concerned about possible attacks, who puts his crew through test drills. There are brief suggestions that he may not be safety-first, as we see him scanning, and ignoring, emails warning of the persistent piracy threat and arguing against steering a course clear of (immediately) dangerous waters. But nothing on screen approaches the claims by crew (11 of whom have brought a lawsuit against the shipping company) that he was extremely difficult to work with and willfully and stubbornly disregarded the imminent dangers (there were two, not one, brushes with pirates prior to the boarding depicted in the movie). Captain Tom is hard-but-fair guy as seen, one who takes command decisively and shows a keen psychological perception of his opponents. He’s the everyman hero we are accustomed to from Hanks. I’m not suggesting Greengrass needed to perform a character assassination on the guy, but one might expect an attempt to balance the different takes; after all, his protagonist is also the co-author of the book Ray adapted. The casting of Hanks seals the deal; there is no Captain Bligh-esque doubt to be found here. Even the same script with a different lead (a Tommy Lee Jones type, say) would have cast a less unequivocal eye on the man. Presumably the events inside the lifeboat are entirely from the real Phillips’ account (so, unless the imprisoned Muse has been interviewed, again it is entirely one-sided). During these scenes Phillips is a scared but cool-headed guy, whose crafty intrigues repeatedly outmatch his opponents (poor, ill-thinking impoverished fellows that they are). He offers to tend their wounds, and shows remarkable fortitude in talking back to and manipulating them (even with the prospect of ransoming him unharmed, it is a surprise that he is left off so lightly; there are no physical reprisals for the treatment Muse received in the engine room). It’s all a bit much to swallow. Even more so that Captain Tom offers empathic olive branches amid his personal plight; this is true American courage on display. He sadly reflects that Bilal is just a kid, reproves Muse for raiding a ship that is simply attempting to get food aid to starving Africans, and even has the gall to draw comparisons between their lots (they both answer to bosses, you know; even viewed as a piece of manipulation on Phillips’ part, this is pretty ungainly stuff). With all this, and by having heroic Captain Tom exclaim, during an especially dramatic moment, that Muse is “not just a fisherman”, Greengrass betrays that in fact this is straight-up Hollywood razzle-dazzle with a thin veneer of verisimilitude attached. Hanks is very good, of course. The scene where he breaks down, unable to put his ordeal into words, is a master class of an unmannered performance. A shoe-in for a Best Actor Oscar nomination. But still, you are in no doubt that this is Tom Hanks, a guy who makes cold-blooded gangsters warm and cuddly (Road to Perdition). You're instantly on side with America's Mr Affable. Having him playing you is tantamount to movie canonisation. Rather than Phillips, a more interesting conversation is just what the film thinks it’s about. Does Greengrass really think he is tackling the haves and have-nots subject with any degree of depth? It strikes me that this is a response he has rehearsed, rather than one that went in tandem with the story. Because, if it had, surely he would have felt compelled to broaden his canvas, to invite discussion of the wider political perspectives involved both in terms of the Somalis and the way the story turned into a massive media event (one which was twerked to the max). The director argues that this material “speaks to the world”, Third World armed desperation feeding off First World wealth. But does it really? When the US Navy (the cavalry!) shows up to save the day and order is preserved? Without the background of why such an overwhelming show of force was needed to save one man in peril on the sea (and at the direct order of President Obama no less; now there’s a publicity coup), or how these fearsome foreigners came to ply their piratical trade, Greengrass shortchanges the viewer and renders his movie rudderless. It may seem obvious to say it, but had one of the SEALs accidentally popped Captain Tom, we wouldn’t be watching the Hollywood version. There is a bit of nominal background to the Somalis, but not enough that we have a real insight into their world (they are cajoled into their high seas sorties; their former livelihood as fishermen has been ruined by external plundering of stocks). We see volunteers for the raiding party assemble on dry land, and the initial stages of the film intercut with the embarkation of the Maersk Alabama. But we have also seen Captain Tom with his ever-loving wife (Catherine Keener), discussing their kids. None of these Somalis have families that we know of, and their humanity is dictated by degrees of culpability. Muse (an outstanding performance from Barkhad Abdi) genuinely appears to want the hijacking to go off without a hitch or casualties, despite earlier having unhesitatingly bashed in the head of a fellow Somali provocateur. Vying for authority is the unstable and khat-fuelled Najee (Faysal Ahmed), physically and temperamentally intimidating. On the opposite end of the spectrum is youngest crew member Bilal (Barkhad Abdirahman) with whom Captain Tom strikes up an almost paternal relationship after tending his glassy foot (aw). Greengrass apparently wants to strip his movie down as much possible to the events on the ground (water). But this is a somewhat disingenuous decision when the back half of your movie concerns the pumped up firepower of the US Navy bearing down on these feckless Somalis, unlucky enough to mess with the greatest superpower on the planet. One starts to ponder why this section is quite so extended, particularly since a previously taut affair begins to sag under the weight of tension stretched that too far. If Greengrass was willing to truncate the crew’s experience in the bowels of the ship from 12 hours to what seems like about 90 minutes in the screen version (and no more than 20 minutes screen time), surely he could have pruned the pursuit of the lifeboat too? It’s not as if Captain Tom’s conversations foster any great insights (The “Maybe in America” response to Tom’s suggestion that there must be something else for the Somalis beyond fishing and kidnapping is as robust an exploration of the have-nots as Greengrass can muster). Do we really need to see the SEALs parachute to the rescue? Couldn’t we just rest easy in the knowledge that they are magically there (one also has to wonder at the casting director’s choice of the most steroidally-enhanced specimens imaginable for the team; surely these guys would need to be light on their feet?) Perhaps it’s just another of example of the legendary stature Hollywood affords these men (perhaps excepting that 1990 Charlie Sheen movie… no, dammit, let’s include it), as Greengrass finds himself fliming a virtual recruitment campaign for the SEALs. Whatever the director’s intentions, this imagery wholly plays into a validation of America’s “might is right” mentality; don’t mess with even one of our countrymen or your lives are forfeit. Having said all this, I don’t think this movie is guilty of the willful ignorance of Black Hawk Down, Ridley Scott’s jingoistic celebration of American military prowess (despite that affair being nothing of the sort). There, the Somalis are faceless cannon fodder. Rather, Greengrass is guilty by omission. If you talk the talk, but aren’t willing to take the time to inform your audience, about what they are watching and why they are watching it, it is fair game to level the charge of misrepresentation and unfiltered mythmaking. All of which is unfortunate because, by every other standard, this is a very good film. That is, every standard other than the one of failing to convey a message needed to justify making it in the first place. Greengrass uses handheld camera like no other director; if anything he has only honed this skills, ensuring the action is always clear and coherent. The bare bones of plot are a natural fit for a screen adaptation. A lack of familiarity with the narrative of the hijack had me expecting that the majority would take place on the cargo ship, so the manner in which the crew turns the tables on the pirates surprised and wrong-footed me. I didn’t think I would have to accuse Paul Greengrass of conveying the level of understanding and piercing insight shown by Ron Howard to his true-life subjects, but he’s partially missed the boat with Captain Phillips. At times this film sails perilously close to being just another America versus the foreigners story. As an action/thriller it is first class, however.